Some folks think smelling like a pirate is something that just happens – go someplace hot, engage in some sort of manual labor (like gutting spaniards), and let the sweat do the rest. And to be honest, this method is highly effective. But it also explains why so many pirates had to pay for their female companionship. So what does a pirate do if he wishes to emit a manly scent – one that bespeaketh of robust skullduggery, and yet still makes the ladies’ toes curl? That’s where Black Phoenix comes in. 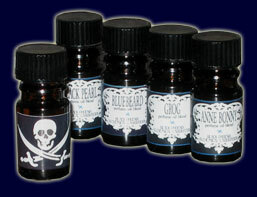 Black Phoenix carries an enourmous variety of scented oils, many of them aimed at the graveyard crowd. But if you’re willing to do some digging, as with John Hawkins, there’s treasure to be found. They in fact offer several pirate-specific oils, reviewed here, and also several pirate-friendly oils (with names like Voodoo and Port Royal,) which I’ve not had opportunity to review, but probably smell perfectly piratey as well. Jolly Roger: Leather, rum, wood – and yet it all adds up to something sweet, but not too much so. The gentleman pirate – refined, but dangerous. Black Pearl: More subtle than Jolly Roger, but also deeper and more mysterious. Musky. Grog: You don’t need to spend the night drinking rum to smell like you have. “Grog” is the ultimate truth-in-labeling – it smells like rum raisins, and is happy to do so. Anne Bonney: Who says guys should have all the fun? Spicey, seductive, and sweet. And perfect for the seagoing woman with a penchant for filleting spanish officers. Bluebeard: Much like Jolly Roger, but less defined and darker. It has a sharpness about it underneath, much like that dagger stashed in your sleeve. This entry was posted in Other and tagged black phoenix, personal care by Bilgemunky. Bookmark the permalink.